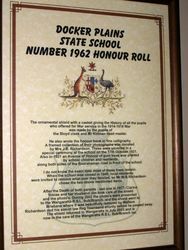 The Docker Plains State School Honour Roll consists of an ornamental shield containing an honour book giving the history of pupils who enlisted in World War One as well as a framed collection of 12 photographs of those who enlisted between 1914 and 1916. The shield and photographs were unveiled in 1921. When the school closed in 1949 the shield and photographs were held privately. 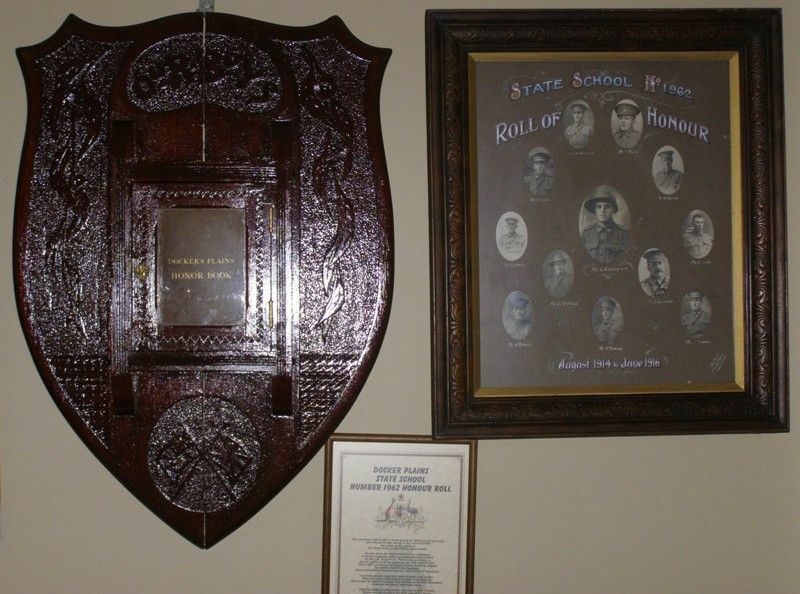 In 2002 the photos were presented to the Wangaratta RSL and the shield was sent to Brisbane where it was restored by Wallace Richardson and Reg Townsend before being returned to the Wangaratta RSL in 2003. 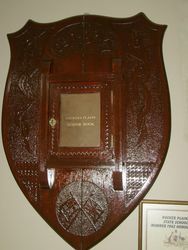 The ornamental shield with a casket giving the History of all the pupils who offered for War service in the 1914 - 1918 War was made by the pupils of the Sloyd class and Mr Kidman headmaster. He also wrote the honour book in fine calligraphy. 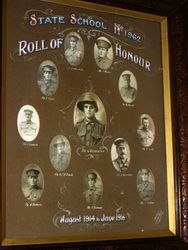 A framed collection of their photographs was donated by Mrs. J.B. Richardson. These were unveiled in a special ceremony at the school on the 17th October 1921. Also in 1921 an Avenue of Honour of gum trees was planted by schoolchildren and residents, along both sides of the Boorahaman road in front of the school. I do not know the exact date most of these trees remain. When the school was closed in 1949, local residents were invited to remeove what ever they fancied, so Mr W.B. Richardson chose the two above mentioned items. After the death of both parents - last one in 1977 - Clarice Tobias and her Husband Jim took care of the shield and the photo`s. During 2002 the photo`s were presented to Wangaratta R.S.L. Sub/Branch, and the shield went to Brisbane where it was beautifully restored by Wallace Richardson and his son-in-law Reg Townsend shortly before he passed away. The shield returned to Wangatta in July 2003 and is now in the care of Wangaratta R.S.L. Sub/ Branch Inc.